NEW YORK, NY--(Marketwired - November 16, 2017) - For the most part, the most popular quick-service restaurants (QSR) Americans know today have been around for decades. However, the ever-changing consumer trends in the QSR sector have created a demand for innovative, fresh brand marketing approaches to stay relevant and engaging with consumers. 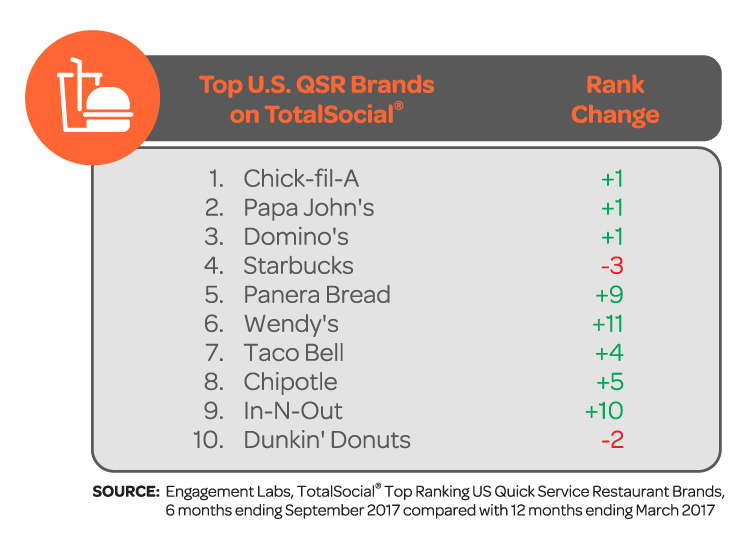 To help QSR brand marketers better understand what consumers are saying in both their online and offline worlds, Engagement Labs has released its latest TotalSocial® rankings of the top-performing QSR brands in the U.S. The report looks at how each QSR has performed in social conversations over the past six months, compared to the Company's previous ranking of the top QSR brands in March 2017. 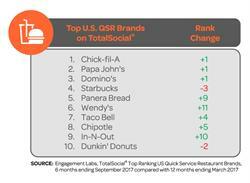 According to Engagement Labs' report, Chipotle, Taco Bell, Wendy's and In-N-Out all made their debut into the top 10 ranking -- pushing down coffee leaders Starbucks and Dunkin' Donuts. The analysis, which is unique in that it combines offline (face-to-face) and online (social media) consumer conversations, is based on Engagement Labs' proprietary TotalSocial data, which continuously measures the most important drivers of brand performance in terms of social media and word of mouth conversations. Chick-fil-A continued its strong performance in the six month update ranking and jumped up to the top spot, knocking off Starbucks from the top as it dropped down to fourth. Over the past six months, Chick-fil-A has improved its sentiment as well as continuing to boast strong volume scores -- demonstrating that consumers are talking about the brand more often and more positively. Recently, Chick-fil-A has made an effort to stay away from controversial stances, all the while expanding into major cities without compromising its customer service, resulting in a more positive consumer conversation around the brand. "An interesting trend we've seen in the past six months is the declining consumer conversations around both of the leading coffeehouse brands, Starbucks and Dunkin' Donuts," said Ed Keller, CEO of Engagement Labs. "In the case of Dunkin' Donuts, the company saw a decline in its sentiment scores, which is a concern because our predictive analytics show that sentiment is an important driver of future sales. Meanwhile, Starbucks dropped in the ranking due to a decline in its brand sharing scores, demonstrating that consumers are sharing less of the coffee chain's content online, while also talking less about its marketing or advertising in offline conversations." According to Engagement Labs' data, Chipotle has a substantially improved online sentiment score, helping it to bounce back from its food safety scares which diminished the brand's performance -- and recovered from its previous ranking at 13 to eighth in the top ten. In addition, the burrito chain recently introduced a new menu item, queso cheese dip, nationwide -- which may have helped boost its performance in consumer sentiment. Wendy's rose sharply in the ranking as a result of an increase in its online sentiment and volume, making its way to sixth in the top ten as the burger chain continues to innovate in the social media space. For example, the brand's unique social media strategy has successfully boosted consumer conversations online, raising it up 11 spots in the ranker. When the brand's "#NuggsForCarter" tweet went viral, the burger chain was able to resonate with its consumers by connecting directly with one of their biggest fans online. Wendy's has also recently prioritized its social media marketing efforts through a partnership with Snapchat, which allowed customers to take selfies for a good cause. Another one of the largest gains seen in the six-month update to the QSR rankings was experienced by In-N-Out Burger, a brand which moved up the rank from number 19 all the way up to ninth in the top ten. The burger chain's improved performance was largely driven by an increase in its offline sentiment score -- showing the brand's ability to get its consumers talking more positively about the brand in face-to-face conversations. In-N-Out was previously a Whisper Brand -- which Engagement Labs characterizes as a brand that experiences low consumer conversations in both face-to-face and social media conversations. However, over the past six months, the brand has transformed into a Word of Mouth Maven -- or a brand which has a more impactful performance in face-to-face conversations than its social media presence.